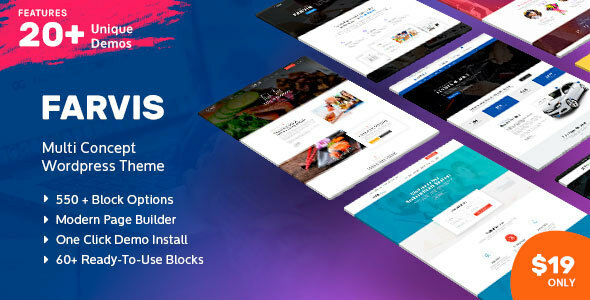 Farvis – Multipurpose theme that is perfect for business , consulting, cryptocurrency, security , automotive , building , wedding , garden , phone repair , medical , plastic surgery , yoga , law , water , yacht and more ..
Quality design and only the most important blocks of information and well-designed layout that will not confuse your customers but will present your services in a clear and simple way. User-friendly interface makes it easy to navigate and find all the information about your business, goods or services, prices, terms and conditions, etc. Every part of the theme can be easy modified using page builder to meet your demands. Modern, stylish and simple is what makes Farvis special. Note: Images used in previews are only for demonstration purpose .